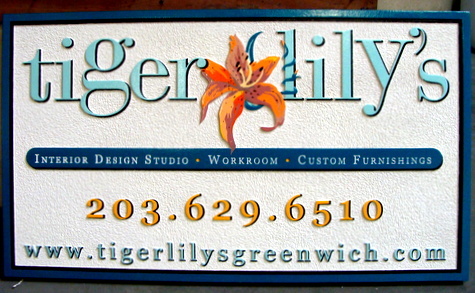 This unique and decorative sign features a beautiful tiger lily and good use of color. The sign makes us want to visit the shop to see equally tasteful furniture. It has both raised and engraved lettering (on the middle bar), a heavy frame, a handpainted tiger lily, and the interior background of the sign was sandblasted in sandstone texture. Aqua, orange, black and white colors are effective here. This sign was made with our CNC router and then sandblasted. It can be mounted on a wall or hung from a wood or iron hanger/scroll bracket out from the wall or a post.